Your company is at a turning point. You have developed an MVP, it works, a handful of customers use it every day, and they love it. You have “product-market-fit”. You’re poised to scale. But where do you start? We started by talking to Mark Roberge. 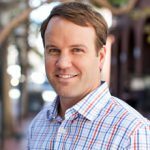 Now a Senior Lecturer at the Harvard Business School, Mark was formerly the SVP of Sales at HubSpot, where he scaled revenue from $0M to $100M and expanded his team to 450 employees. An engineer by trade, Mark is known for designing data-driven systems that help companies anticipate and generate success in sales. At the 2018 Mainsail Executive Summit, Mark shared his insights on creating a data-driven pathway to successful revenue growth. In this three-part series, we share key take-aways from each of Mark’s milestones. 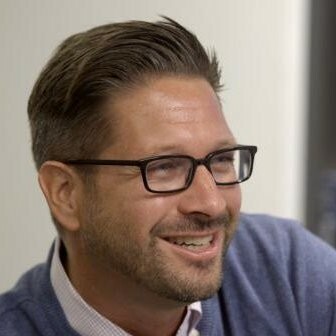 According to Mark, “the first mistake many companies make when they begin to scale is they are overly optimistic on the breadth of their product-market and go-to-market fit.” A company may have reached $1 million in revenue selling Product A to Customer Segment X through an MQL demand generation strategy. For the following year, they commit to tripling revenue to the board and themselves. However, half the revenue growth is intended to originate from a product or market or channel that the company has not proven out. For example, they may plan to start to expand demand generation from MQLs to outbound calling. They may plan to start selling to a new customer segment. They may develop a new product to upsell to their customer base. These expansion plans are necessary for growth. However, the company assumes everything they learned in the current product/market/channel will immediately apply to these new areas. Unfortunately, they rarely do. Break up your market into actionable segments. To avoid this scaling issue, analyze your business through each product/market/channel lens to understand where you are ready for scale and where you are not. 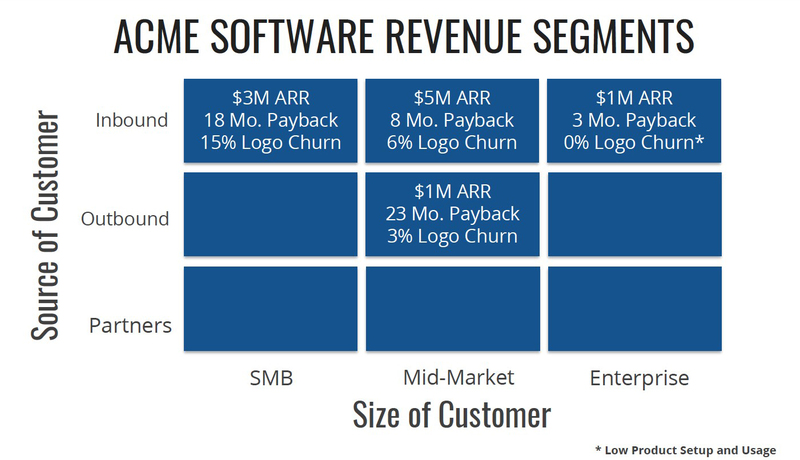 Below is an example of a company’s revenue base viewed through the lens of 3 channels (inbound/outbound/partners), 3 customer segments (SMB/mid-market/enterprise), and a single product. Mark points out these segments can be based on a number of attributes, including geography, industry, etc. Once segmented, you have a clearer view into which product/market/channel areas you are ready for Scale, where you should Experiment, and where you should Ignore. “Experiment” Sections: Maximize learning with a small cross-functional team. 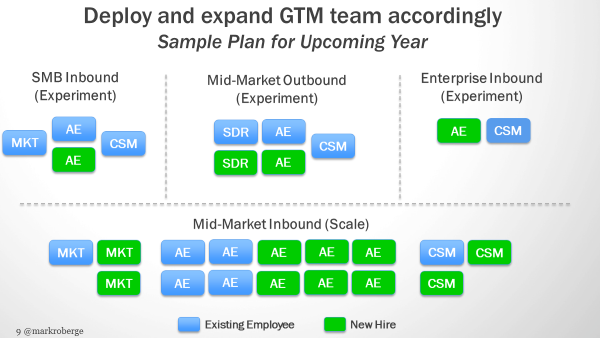 Now that your markets are segmented, introduce small cross-functional teams in your experiment segments to turn them into scale segments. Focus your team-building on hiring innovators who are excited to improve the product, not just sell it. Run a daily film review to listen to prospect calls and learn from the front line. Mark suggests that many entrepreneurs and investors scale pre-maturely. They begin measuring top line revenue growth as the key indicator of success and underweight customer value creation and retention. This perspective originates from the “shelfware” days of on-premise software where all that mattered was getting the upfront contract and payment. Once purchased, customers were stuck with the software. It didn’t matter if anyone used it. However, the disruptive effects of the cloud, SaaS, and the subscription economy have changed this dynamic. Today, the friction for a customer to try a product is dramatically reduced, but so is the friction to leave. The subscription economy shifts focus from Total Contract Value (TCV) to Lifetime Value (LTV). Every customer has a big megaphone called social media to talk about good, and bad, product experiences. Companies need to demonstrate that they are consistently creating customer value and retention before they aggressively scale. The goal of sales is customer value creation. Revenue and profits are an outcome of customer value creation. Find your leading indicators and instrument accordingly. The best measure of customer success generation is customer retention. Unfortunately, customer retention is often a lagging indicator, taking months or even a year to surface. As a startup, time us not on our side. Companies need to define a leading indicator to customer retention, often referred to as the “ah-hah” moment. This leading indicator is often measure-able in the first 60 days of a customer lifecycle and is related to product setup and usage behaviors. 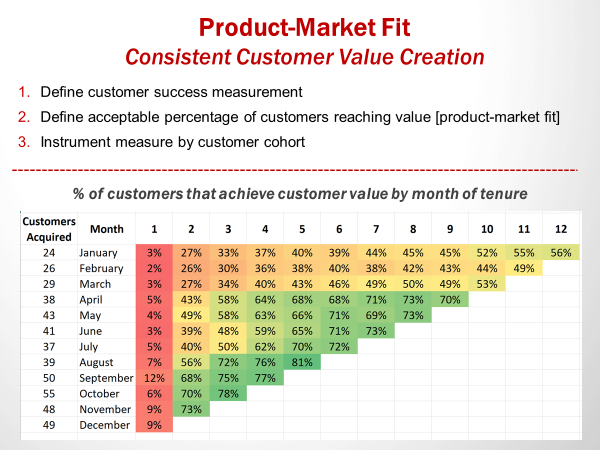 Once defined, the company can start measuring how each customer cohort is performing against this leading indicator. When 70% to 80% of customer acquired in a month are hitting the leading indicator within 60 days, the company can then move forward to the Unit Economics phase of growth. Below is an example of a company tracking their progress on the leading indicator of success with each customer cohort. 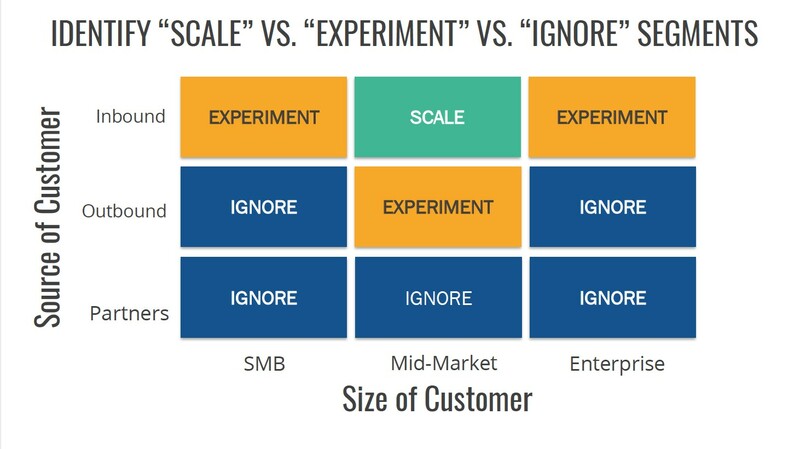 Mark recommends this slide be a part of every startup board deck to analyze whether a company is ready for scale and whether they are scaling too quickly. Re-define Marketing Qualified Leads (MQLs) around customer segments that are generating the most customer value, not segments that are easiest to close. According to Mark, it is hard to invent a new product and consistently create customer value. However, it is a required foundational piece for any great business. During this phase throw everything and the kitchen sink at consistently creating customer value. However, once achieved, the business must demonstrate they can create this value profitably. They are ready to shift focus to unit economics, which is outlined in Part 2 of this series.